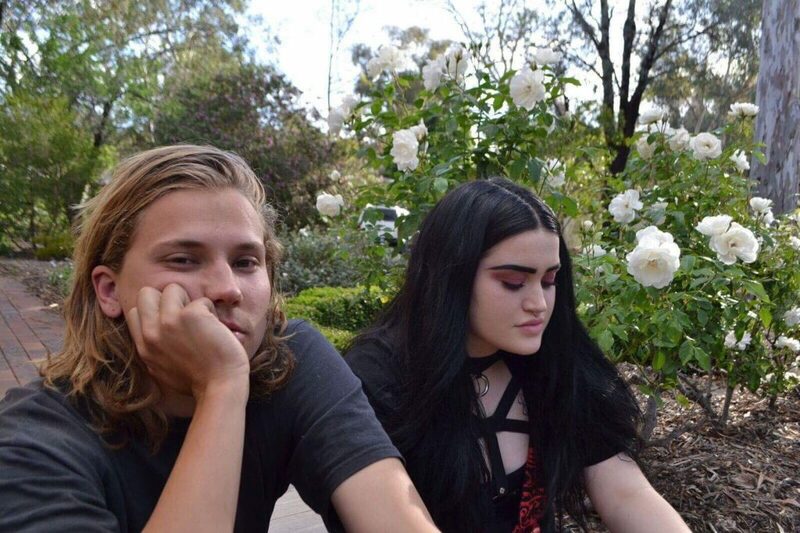 Together Africa Mylchreest and Angus Mcandrew make up Canberra’s newest, silkiest dream pop duo. If you like your drums made by machines and your synths drowned in reverb, you’re in luck; NEKO PINK are here to make your dreams come true. The pair took some time out ahead of their appearance at Braddon’s Renaissance to chat about the foundations of every successful band, namely cats and 80s new wave. How did the band form? And where’d the name come from? [Angus]: Well I had these pop songs I had written in my bedroom, I knew I wanted to do something more with them, so I messaged Africa, who I actually barely knew at the time, and showed them to her. We took off from there really, swapping ideas and concepts. Well ‘neko’ is the Japanese word for cat, which we both adore, plus pink is just our colour, so it made sense. [Africa]: Angus hit me up out of the blue a week or two before leaving to Japan for a month so it was a while before anything started and I honestly thought it would fall through. Angus linked me a small EP he had put together to give me an idea and I loved the sound and the artwork: it was very Japanese inspired and pastels! I love Japanese culture and we both love cats so Neko made sense and Pink just set the vibe I felt we were going for. Also I’m a sucker for anything pink. How does the writing process work in Neko Pink? [Angus]: It usually starts with me coming up with a basic groove for a song, I’ll show Africa and if we like the direction we’ll expand on it piece by piece, adding concepts and ideas from different places until it comes together. [Africa]: Basically what Angus said. He’ll show me stuff he’s fleshed out and sometimes it’ll immediately spark ideas for lyrics and melodies in my head, Angus just has a way of writing music that incites ideas, sometimes I can’t think of anything because some pieces are so beautiful instrumentally. What are your main inspirations, people/places/things? [Angus]: I take so much from the 80s new wave era, the idea of creating and revolutionising an entirely new genre of music is inspiring, and of course brave. I’m also a huge fan of everything Kevin Parker (Tame Impala) does. Plus of course Canberra and its people! [Africa]: Daily life, love, Canberra, Japan. Cats, the colour pink, kawaii fashion, gothic culture. I think I have to mention rap/hip hop too. I find I’m always writing lyrically dense songs and occasionally slipping in some references, I think listening to so much rap has just engrained that into my head, I’ve got a lot to say. What is the connection between Japanese culture and the music you make? [Angus]: Just before Neko started I had spent a month in Japan by myself, the whole trip was incredible, Kyoto by night, Tokyo in the rain, the Hokkaido mountains, Japan definitely inspired this band in many ways. [Africa]: I’m a weab who makes music. Neko Pink are playing at Renaissance, a once-off event taking place in the Hamlet in Braddon. What about the event has got you hyped? [Angus]: Everything, it’s a fantastic opportunity for artists and musicians to showcase their art in a gorgeous environment, the organisers have really done a great job on this one. [Africa]: I am hyped about everything, I’m envisioning an amazing afternoon/night with the sun setting, the air smelling fresh and feeling like everything is rich. Which Canberra artists do think are really shaking up the local Arts scene at the moment? [Angus]: Some names would be Sophie Herring, Thomas Bigmoras, Lefty, Sleeping Dogs, Eloria, Tyler Durden, all people pushing the norm and creating some really gorgeous art/music. [Africa]: I think you can’t talk about the local arts scene without mentioning Genesis Owusu, shout out to another fellow weab. He’s been making massive waves. Also Theory, I know he’s dropping an album soon. I think we are gonna see some momentous things, he has such a positive and powerful presence especially on stage. Weirdo Gvng too they put on a wild live set! Would you rather: Gothic or Romantic? [Angus]: Can’t we have both? [Angus]: More and more music. we aren’t short of ideas and the music comes so naturally to us so we just want to keep releasing and playing live. We have been talking about a full-length, but that way be for a few months at least. [Africa]: More music, an EP in the next two months, lots of live shows. I would LOVE to release some merch for the fun of it to be honest I have so many ideas: e.g. 80s windbreakers with our branding colours of pink and cyan and ‘Neko Pink’ written in nice detailing somewhere! But music is the goal, to just get more out there, play more shows. Catch NEKO PINK at RENAISSANCE on Friday March 2 alongside THE ANSAH BROTHERS, KILROY, WEIRDO GVNG and more. Renaissance is set to take over The Hamlet on Lonsdale Street in Braddon. Free entry.